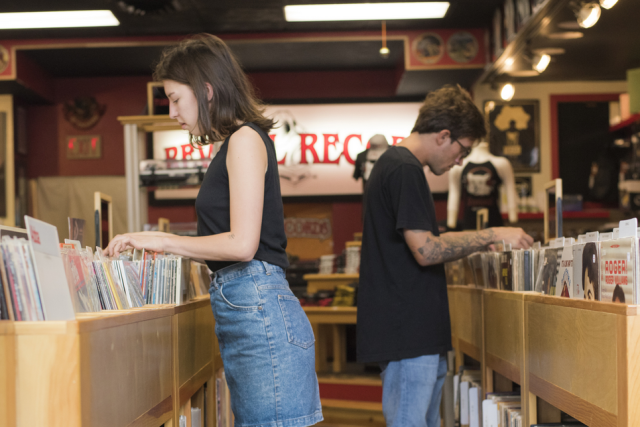 Action City’s 30,000 sq. ft. trampoline park is officially OPEN! Action City is home to the Midwest’s largest indoors go-kart track in addition to countless other attractions such as laser tag and bowling (just to name a few). Beyond this, it’s a part of the Metropolis Resort and Conference Center, which also houses Chaos Water Park and the Metropolis Hotel. 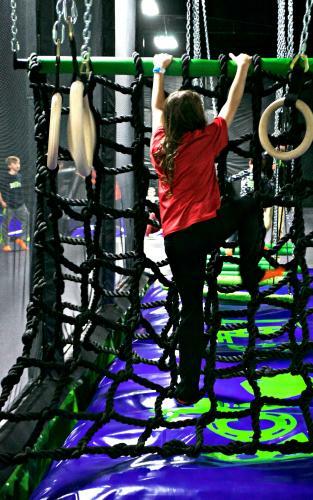 The trampoline park is the newest addition to Action City, and it already has kids (ok, yes…and adults) throughout the Chippewa Valley jumping for joy. 1. There’s an indoor, multi-level playground to explore. Do you remember being in awe of the indoor playground at Chuck E’ Cheese?Picture that, but a million times better and with trampolines EVERYWHERE.There’s a way to bounce in every single compartment of this soft play area.I’m in my 20s, and I don’t even know how to capture all of the emotions I felt while running around in this playground!Even if you’re 90-years-old, I’m telling you: go to it. 2. You can challenge your friends like they do on Ninja Warrior. 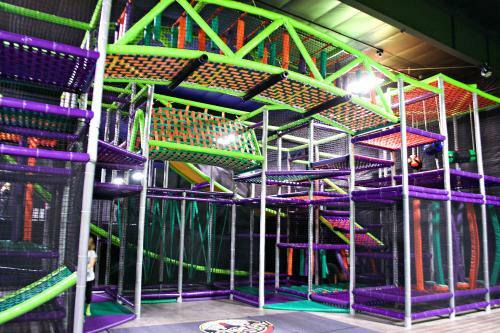 The new trampoline park features multiple obstacle courses: one with twelve obstacles and one with four obstacles. (Moreover, one is more geared towards children, whereas the other one is more geared towards adults. 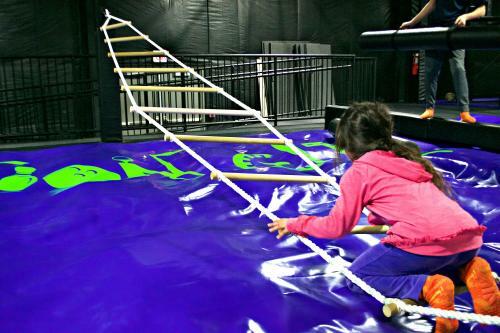 )As is suggested by the name, the obstacle courses are based off of the ones seen on the popular TV show Ninja Warrior.While the obstacles seem easy at first glance, they’re not; but hey, it’s the perfect way to get your workout in for the day!! Additionally, directly across from the obstacle courses are a slack line and a fidget ladder.Talk about the perfect opportunity to hone those balancing skills before tackling the real deal! 3. They have Slam Dunk Trampoline Basketball. CUE THE SPACE JAM THEME SONG! Even if you’re not good at sports (cough, me, cough), it IS possible to fly high like Michael Jordan! The Slam Dunk Trampoline Basketball Courts make it possible for every child (and man-child and woman-child) to feel like a professional basketball player.It’s easy to make a slam dunk in this basketball court! Basketball not your cup of tea? Alternatively, you can show off your competitiveness in one of the trampoline dodge ball courts or by challenging your friend to the gladiator joust.No matter what, you’re sure to have a good time! 4. There’s an air bag jump! If you were one of those poor unfortunate souls who didn’t get to grow up with a trampoline, this is your chance to FINALLY perfect all of those flips like your friends did! The trampoline park’s air bag jump is a giant foam pit; you can do cartwheels, somersaults, and round-offs galore and then land into a pit of happiness. The trampoline park hours are the same as the Action City Fun Center attractions, so you have all the time in the world to check out the park! So, what are you waiting for? 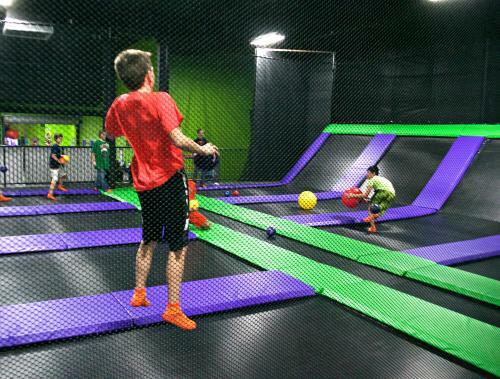 HOP on over to Action City’s new trampoline park today!